EPA 22 MPG Hwy/16 MPG City! RST trim, CAJUN RED TINTCOAT exterior and JET BLACK interior. 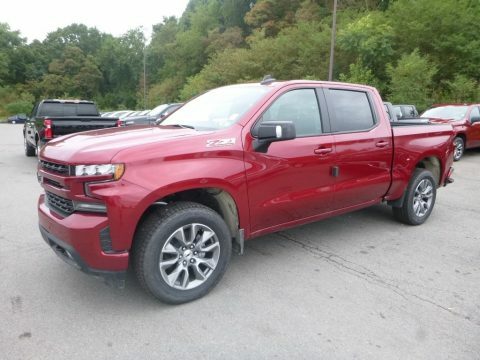 Rear Air, 4x4, Turbo Charged, Remote Engine Start, Onboard Communications System, Back-Up Camera, Bed Liner, CONVENIENCE PACKAGE AND MORE!======KEY FEATURES INCLUDE: 4x4, Rear Air, Back-Up Camera, Turbocharged, Onboard Communications System, Remote Engine Start. Keyless Entry, Privacy Glass, Steering Wheel Controls, Heated Mirrors, Alarm. ======OPTION PACKAGES: ENGINE, 5.3L ECOTEC3 V8 (355 hp [265 kW] @ 5600 rpm, 383 lb-ft of torque [518 Nm] @ 4100 rpm); featuring all-new Dynamic Fuel Management that enables the engine to operate in 17 different patterns between 2 and 8 cylinders, depending on demand, to optimize power delivery and efficiency, CONVENIENCE PACKAGE includes (CJ2) dual-zone automatic climate control, (A2X) 10-way power driver seat including power lumbar, (KA1) heated driver and passenger seats, (NP5) leather-wrapped steering wheel, (KI3) heated steering wheel and (N37) manual tilt/telescoping steering column (Crew Cab models include (R7O) Cloth Rear Seat with Storage Package. ), WHEELS, 20" X 9" (50.8 CM X 22.9 CM) PAINTED ALUMINUM with machine face and Argent Metallic pockets, SAFETY PACKAGE includes (UD5) Front and Rear Park Assist, (UKC) Lane Change Alert with Side Blind Zone Alert and (UFG) Rear Cross Traffic Alert, BED PROTECTION PACKAGE includes (B1J) wheel house liners and (CGN) Chevytec spray-on bedliner, SEAT, CLOTH REAR WITH STORAGE PACKAGE 60/40 folding bench for Crew Cab models, includes seatback storage on left and right side, center fold out armrest with 2 cupholders and underseat jack storage, TRANSMISSION, 8-SPEED AUTOMATIC ======EXPERTS ARE SAYING: Great Gas Mileage: 22 MPG Hwy. Horsepower calculations based on trim engine configuration. Fuel economy calculations based on original manufacturer data for trim engine configuration. Please confirm the accuracy of the included equipment by calling us prior to purchase.